Huddersfield have signed Cardiff City captain Mark Hudson on a two-year contract for a nominal fee. 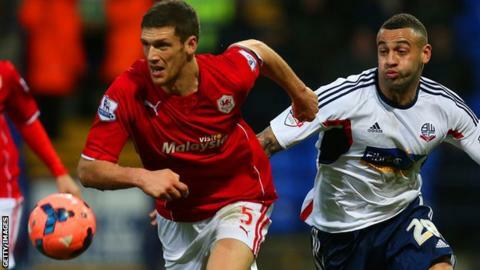 The Bluebirds bought Hudson, 32, from Charlton in 2009 and he went on to make 165 appearances for the Welsh club. He has played three times in the Championship so far this season. Terriers caretaker boss Mark Lillis said: "The club has stayed patient to bring in the right man to improve the defensive options and that has been rewarded with this arrival of Mark." Prior to his time at Charlton, Hudson played for Fulham, Oldham and Crystal Palace. "Organisation and experience are very important attributes in the heart of your defence and Mark has both in abundance," added Lillis. "He is a leader with vast experience of the Championship and is a massive arrival for this football club."